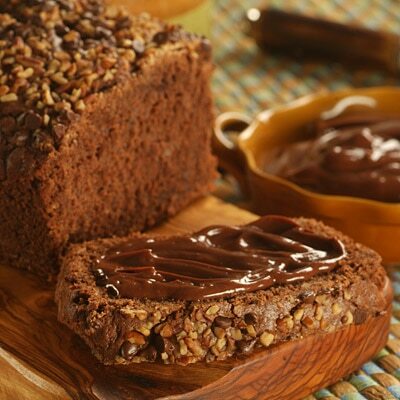 Delicious Chocolate Quick Bread is easy to make and your family will adore it. COMBINE flour, cocoa, salt, baking powder and baking soda in medium bowl. Beat butter and sugar in large mixer bowl until creamy. Add eggs, one at a time, beating well after each addition. Gradually beat in flour mixture alternately with buttermilk. Fold in 1/4 cup pecans. Pour into prepared pan. BAKE for 20 minutes. Top with morsels and remaining pecans; continue baking for 30 to 35 minutes or until wooden pick inserted in center comes out clean. Cool in pan on wire rack for 10 minutes; remove to wire rack to cool completely. Serve with Chocolate Honey Butter. MICROWAVE 1/2 cup NESTLÉ TOLL HOUSE Semi-Sweet Chocolate Mini Morsels in small, uncovered, microwave-safe bowl on HIGH (100%) power for 30 seconds; STIR. The morsels may retain some of their original shape. If necessary, microwave at additional 10 to 15-second intervals, stirring just until morsels are melted; let cool. Beat cooled morsels, 1/2 cup (1 stick) softened butter and 2 tablespoons honey in small mixer bowl until fluffy. Makes about 1 cup. *NOTE: If you do not have buttermilk on hand, you can substitute sour milk made with NESTLÉ CARNATION Evaporated Milk (Regular, Lowfat or Fat Free). Measure 1/2 cup NESTLÉ CARNATION Evaporated Milk into glass measuring cup. Add 1/2 cup water and 1 tablespoon vinegar or lemon juice; stir. Let stand for 5 minutes before using.